5.0 out of 5 starsLOVE IT.. Cant wait to read more of this author. A first time read for the author with this book. And I loved it. Beautifully written so that the hot chemistry jumps through at you. This had me right from the first page. The title of this is perfect for this short story too. Yah I'll be stalking this author now lol. 5.0 out of 5 starsGreat weekend book to lose yourself in. Dex and Ollie remind me alot of a gay Romeo and Juliet. Dex has known he was gay for a few years but kept it locked tightly in the cupboard due to fear. Fear of disappointing his mother, fear of rejection by his step father, fear of disgust by his step brother and fear of violence from the general population. After avoiding going home for years for the holidays he can no longer ignore his mothers requests, with one final night of freedom before having to go back in the closet he visits the underground gay nightclub masquerade ball where he meets Batman. Ollie has lived the last few years wondering. Wondering why his step brother left, wondering what he did wrong, wondering how to make everything better. Living a lie is wearing Ollie down deciding to finally getting some answers Ollie goes home but not before he lets himself be free. What a holiday treat this story is by this fabulous author! When you stumble upon an author who turns out to be awesome you just have to get all of her books as quickly as possible and I devoured this short story with glee. Both lead characters get the opportunity to tell things from their point of view but it is mainly told from Declan's point of view. They are both gorgeous characters who are very easy to like. Both parents are likeable too and pretty cool as far as parents go! There is a bit of everything in this story; some fun, some drama with anxious moments, raw sexual passion and underlying it all a love story. 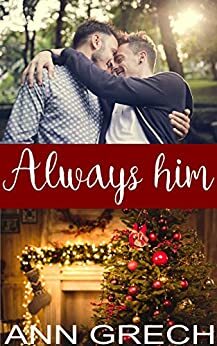 Always Him' was a beautiful love story, I really enjoyed this short read. This taboo novella have me from the first chapter, I couldn't put it down, some parts were a little predictable but I didn't mind as I loved the story. Declan and Ollie are stepbrothers home for the Christmas break. Declan doesn't know Ollie is in town initially, he probably wouldn't be there if he knew, he's been avoiding Ollie for years. He sees Ollie constantly in his dreams which is more than he can take. A passionate hookup with a strangely familiar Batman and then the arrival of Ollie has Declan confused and sad, but maybe not for long. it should be a time for the whole family to connect. Declan's whole world was turned upside down when he was a young boy. and the next she was swept up by a man, a very rich man , who had a son the same age as him. and for their place in the family dynamics. It took a while for Declan to acknowledge his true feelings for Ollie. How could he want his stepbrother ? How could he pretend to hate him , when all he wanted was to kiss him? How could he risk his family falling apart at his confession ? No, he couldn't do that to his mother, and the boy he knew he loved desperately. So Declan ran, he moved away as soon as he could, and tried to keep his distance. But is was Christmas, and his mother had summoned him, so he had no choice but to return. he goes to the local Gay Bar who are hosting a super heroes party. There he bumps in to Batman, and boy oh boy do they connect. They have a very hot, very intense, short lived " private party"
with the taste of him still very fresh on his mouth and his mind. How could he fall for another guy, when he was in love with Ollie? Could he really want two people at once ? Declan was confused and conflicted, but he also still had the festivities to go through. Declan and Ollie decide that they need to talk before they leave town again. Ollie is desperate to know why Declan hates him, he wants to know what he may have done. The two go out for a drink, after a good night they are walking back when tragedy strikes. An awful event, that will leave your blood running cold, has both men in hospital. Forced to analyse their feelings, and their lives , what will the men decide? How will Declan move on with his heart so broken ? How will Ollie confront him , and demand answers ? It will weave it's magic around Declan and Ollie and their parents.